Craft breweries seem to love making wheat beers in the summertime. The light and refreshing ales made with wheat tend to complement the warm weather. Wheat beers also work well with added fruit flavors, so many are brewed with lemon, orange, blueberry or other types of fruit. Mystic Brewery of Chelsea, MA makes a wheat beer as their summer seasonal, with a little bit of a twist. Like all of their seasonal beers Mystic’s summer beer is a saison. Mystic Hazy Jane is a summer wheat saison, brewed with one of Mystic’s in-house yeast strains, wheat and barley malt and a selection of American, Japanese and noble hops. Hazy Jane is brewed in honor of the summer solstice with a flavor made to complement the hottest days of the year. 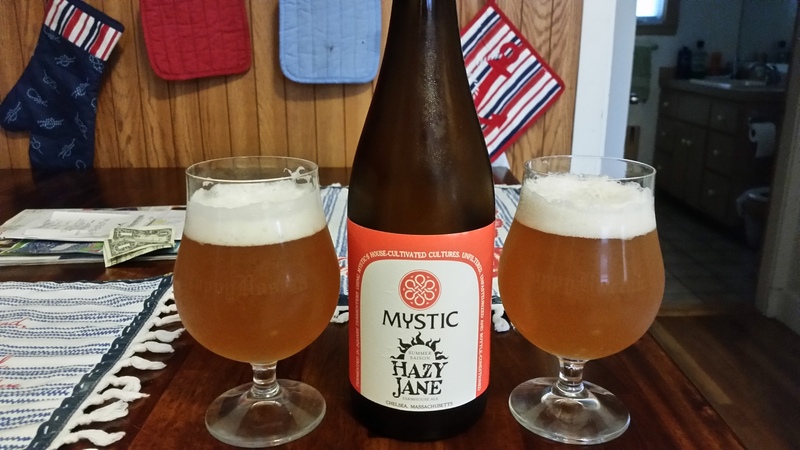 Mystic Hazy Jane pours a cloudy light peach with a moderate white head. The smell is a pleasant mix of fruity Belgian yeast and earthy hops. The taste starts with the yeast with notes of pepper and clove followed by some bubblegum and pear. There is solid maltiness including spicy wheat malts. The hops are very present in the flavor too, with touches of pine, flowers, grass and a little lemon. There is a lot going on in this beer, very complex but everything works together. Hazy Jane is easy to drink, although at 6.5% ABV it packs a little punch for a light bodied summer beer. This is much better than your typical summer wheat beer, the estery yeast and aromatic hops add so much to the beer. Buy some before it’s gone! Hoppy Boston score: 4.5/5.